Alice In Chains has always been a favorite among the hard luck success stories that broke out of my hometown in the late 80s and early 90s. Looking back now, it doesn't even seem possible that they could catapult themselves so far on the back of three albums. It seems equally impossible that the band would find its second wind some 17 years after the release of Dirt (1992). Black Gives Way To Blue (2009) was a big chance with William DuVall as the vocalist/guitarist to complete the quartet, filling a spot left vacant by the late Layne Staley. 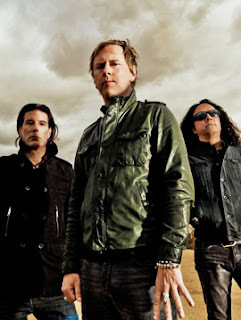 But it was also a needed and necessary chance for Jerry Cantrell (guitar/vocals), his long-time friend Sean Kinney (drums), and Mike Inez (bass) who had truly earned his place after almost a decade. Black Gives Way To Blue was a make it or break it album that would dictate whether the reunited band could stay intact. It did, but in some ways only barely because the band was still recovering from the loss. The Devil Put Dinosaurs Here is the earned next chapter everyone wanted. Although shaken by the death of original bassist Mike Starr shortly after Cantrell had announced that there would be a fifth album (as well as Cantrell being plagued by injuries to his back and shoulders), Alice In Chains managed to create an album with a newfound confidence. The past, it seems, is finally in the past. Opening with a heavier, plodding, and more sinister sound, Hollow sets the tone for the entire album. This is their heaviest release, providing a progression and new confidence to be their own band. Stone also proves that although the band has put the past behind them, they haven't forgotten it. The song is a slow burner while weaving in tonal elements no one else could make with the same conviction. Even slowed down, the lyrics snake back and forth between hallucination and hard fact. Stone works because it commits, even if the song is about making no commitments. They've made no commitments on The Devil Put Dinosaurs Here either. The sludgy guitars and haunting melodies are alive and well, but there is a freshness to the album after the openers, including the throwback arrangements in Pretty Done. Voices adds in much a more lush and varied sound, bringing to mind some of their acoustic-driven songs of old. What makes the track stand out is how perfectly Cantrell and DuVall harmonize. It's easily one of my favorite tracks on the album, keeping with the aesthetic without the constant need to be ominous. The title track, however, proves the opposite is equally true. It's an aggressively lumbering sarcastic stab at religion, especially sentiments that don't make much sense. The argument that the devil buried dinosaur bones is one of them. The challenge of reconciling homophobia is another. The criticism is refreshed with the reminder that Cantrell was always at the center of Alice In Chains creativity. Other knockouts include Lab Monkey for its thick bass and great guitar work, Low Ceiling for its self-assured and claustrophobic lyrics, and Choke for bringing back equal parts acoustic air and melancholy. While those are among the best, expect plenty of people to criticize the almost 70-minute long album for lagging at points (namely Hung On A Hook). Maybe that sounds true at times, but I suspect both Scalpel and Breath On A Window will eventually stand the test of the time. They are largely underrated, mostly because of how they compare to other standout tracks. On their own, both songs are as good as anything else Cantrell has composed, even if they are less accessible. The Devil Put Dinosaurs Here Kicks Up 8.2 On The Liquid Hip Richter Scale. The best part of the fifth studio album released by Alice In Chains is how comfortable the band has become with each other and the sense of confidence they instill in anybody listening. What once sounded impossible — that Alice In Chains would be back with new material — no longer seems improbable. It's almost like welcoming an old friend home. It isn't as good as vintage, but it is still something to look forward to hearing refreshed every few years. The Devil Put Dinosaurs Here by Alice In Chains can be found on Amazon. You can also download it from iTunes or order the album from Barnes & Noble. As expected, the band is already lining up a heavy tour schedule for the summer and beyond. Check it out on Facebook.